We allow dogs in the gardens but they must remain on a lead. They can not come into the Potting Shed Tearooms. Chippenham Park Gardens - This was later informalised in the 18th century and has been greatly extended by the present owner. 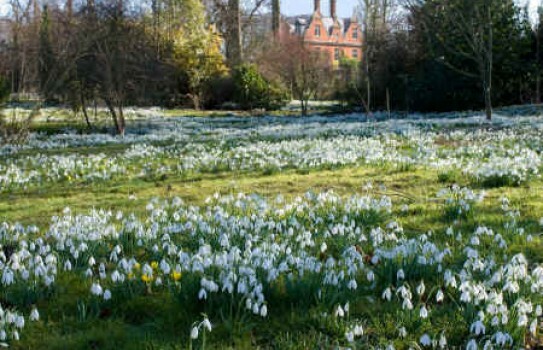 Sweeping seasonal displays of daffodils and snowdrops. Over 250 roses, grand-scale borders, wooded walks and winter-gardens around the ancient canals. A remarkable contemporary formal garden in the old kitchen garden has been recently added. Please note that Chippenham Park contains several stretches of open water that would be spoiled by fencing or obtrusive signing. We ask parents of small children to take care while visiting the Park. Refreshments, hot dogs, cakes etc. Dogs on leads only. Most of the gardens are wheelchair accessible. Why not stay at Chippenham Park Garden. This hotel has genuine guest reviews enabling you to book from anywhere in the world in total confidence. Not only do we feature hotels near the garden, we also feature hotels worldwide and at all major airports. Special prices up to 70% off standard rates as well as hundreds of exclusive deals. Look now - click here.